Comodo Firewall is your first layer of defense against viruses, malware, worms, Trojans, hackers, and all Internet threats. In order to prevent threats from occurring, rather than just detecting them when it's already too late, Comodo's Firewall utilizes unique Default Deny Protection. When a file or application knocks on your PC's door, Comodo Firewall is able to access a safe list of over 15 million files and applications that are known to be PC-friendly. The UNIVERSAL installer is quite large. Approx. 219 Mb. So, to the IDIOTS whining about the size, PLEASE learn to read the screens and do some research. The installer contains BOTH the AV and the FW. Along with a little "bloat" called GeekBuddy and the Comodo version of a browser. BUT, you can do a selective install and install ONLY WHAT YOU NEED. Now, as to the review part. The firewall is put simply THE BEST freebie FW out there. PERIOD. Personally I use latest Comodo FW and latest Avast Free AV. This makes for the ideal configuration. And just to avoid "issues" always install the FW FIRST, then the AV. So, PLEASE READUP on this instead of the never ending whining. same file size as the antivirus to bloated just want the firewall ! do you hear me? Does its job, but extremely bloated. 219MB download for a firewall, really? There's alternatives 1/10 of that size. 84,750 kb???? No thanks. I've switched to Windows Firewall Control. Just 500kb, less memory overhead and uses Windows 7 native firewall. Nice piece of sotware. Really a great firewall. I use it for a very long time now on windows 7 64.
the firewall part in highest protection mode will let you create any rule you want. there's a mode for people who don't like to control the all trafic on their machine and let the firewall decide to allow trusted applications. There is also the famous Defense+ with the sandbox to complete a very high level of protection. If you decide not to use the sandbox and do not chose to treath unrecognized files as blocked (impossible to run any file wich is not is the comodo trusted list or if you didn't add it as tusted file), so if you chose the Defense+ detection, you'll know everything about a program activity from the first operation to try to run on the system (if you allow it) to the last and then the program is loaded into the memory. that's interesting to see how a program is coded and wich dll it's uses, wich process it calls, if it creates files or modify the registry, that's how we can detect a malicious file by it's actions it will try to execute, malware activity is always easy to guess, trying to find a way to take control over the system. so even if the scanner is not able to detect the danger, the defense+ will show you that it's easier to bypass a scanner than a HIPS, and with the sandox, you just have to set the unknown files as blocked and it will become very hard to be corrupted. anyway, it's better to add a scanner that is working fine with comodo FW like kaspersky or you can use the comodo scanner. Comodo Firewall is really the best security tool you can get on windows, the fact that it's a freeware doesnt change anything on the quality of this program. it's hard to for comodo competitors to fight as sharewares as there's nothing that is better than comodo Firewall, if so ? wich Firewall is as good ? 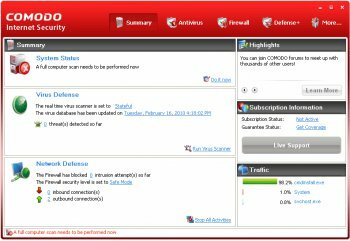 for real, not a fan reason, Comodo Firewall is the best for a long time now ! oh yes and i forgot the cloud with the firewall and the community that is very helpfull. and the team coders are very reactive to fix bug or issue. and if you're not good with computer security, you can buy an online service 24h/24 365days, and a technician will help you remotely to fix your system for any problem you'll have, about virus or about your system working bad. Is it still connecting to 'the cloud' ? If so it will not be used by me. It has protected me for a long time! Comodo, listen to your users FULLY and respect their wishes.